FAQ | Wat Sangharatanaram Inc.
How did the temple start? The temple started almost 15 years ago. Since then, the premise has been built by the support and donation of both the Thai and Australian communities. Together, we share and welcome all to Wat Sangharatanaram, the Gold Coast Thai Temple. 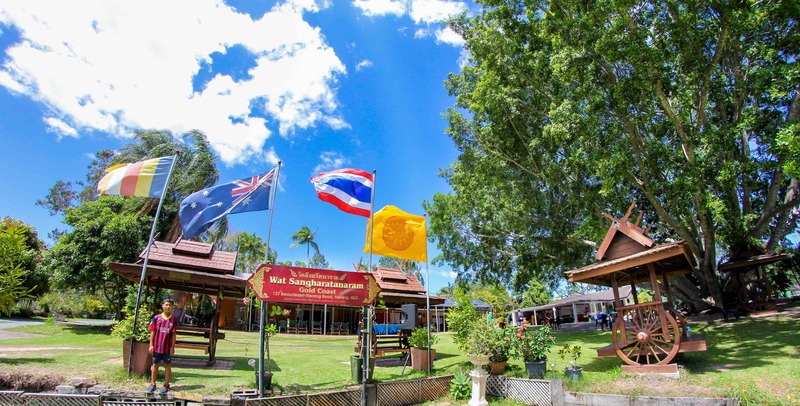 The Gold Coast Thai temple is headed by the top ranked monks within Australia which then work in collaboration with the board of Wat Sangharatanaram. All committee members are volunteers and work out of their time. Further, the Thai temple is fortunate to have volunteers who attend the temple regularly and offer their time in various capacities. Where do the monks come from? Most, if not all monks come from Thailand. There are other Thai Buddhist temples around Australia, so oftentimes you may see visiting monks from Sydney, Canberra etc. We are open 7 days a week from 09:00am. We recommend if you are visiting to visit between the hours of 09:00am – 03:00pm. The community gather on a regular basis on every first Sunday of each month. You can expect to learn and experience more of the Thai culture, meet new people and try some delicious Thai food! What Buddhism is practiced at the temple? Cars are most welcome to park on premise near entry. Please don’t park in the streets. We are not allowed to park in the streets outside the temple by the GCCC. Please follow the instructions of marshals, and write down your mobile number so it can be read on top of your dashboard as a courtesy to others when you block them in. Who can go to the Thai temple? Wat Sangharatanaram is a public place of worship meaning that it is open to the general public. All are welcome to attend including Thais, non-Thais, Buddhist, non-Buddhists, all ages etc. How many monks are usually there? Can I bring food/drinks to offer to the monks? Yes. Buddhist Thai monks eat only one meal a day; if you wish to bring a plate to offer, please do so from 09:30am before the Buddhist chanting commences at around 10:00am. All visiting guests should dress modestly. In accordance to dressing appropriately at the temple, we ask both men and women at all times to not wear sleeveless tops/singlets and to have long enough pants/dress to cover the knees. Sarongs at the temple are available free of use if you wish to use them. Are women allowed to touch the monks? No. Women are not allowed to touch male monks or their robes. If women are required to hand an object to a monk, hand it first to a male or place the object on the ground within reach of the monk. For more information, please feel free to read: ‘Temple Etiquette’, <http://thailandforvisitors.com/general/templetikit.html>. What time do the monks chant? Yes. You are most welcome to make a donation physically at the donation box when visiting the temple or online via bank transfer on our Donate page, <http://www.watgc.com/donate-บริจาค/>. How can I learn more of Thai Buddhism? Please feel free to contact us with details on our contact page. How can I get involved at the Thai temple? We would be more than pleased to hear from you! Please feel free to contact us with details on our contact page. Yes. If you wish to bring a tour, study, school, or other group, please feel free to contact us with details on our contact page. We would be more than happy to welcome you! Is there a Thai-Australian community organisation? Yes. Please feel free to visit and contact the Thai-Australian Association of Queensland Inc., on <www.taaq.org.au>.